What type of arthritis do you have, and how does it affect you day to day? 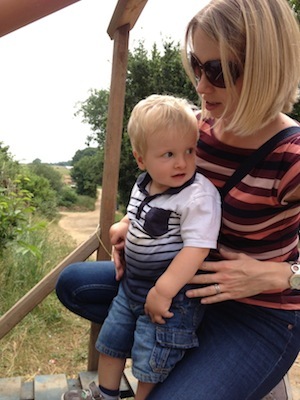 I was diagnosed with rheumatoid arthritis in 2013 at the age of 31, about six months after giving birth to our son, Ollie. It mainly affects one of my wrists and one ankle, so I’m not always as mobile or as strong as I used to be and it can be very painful and draining at times. What have you found most difficult about looking after your young child while coping with your arthritis too? Because of waiting lists, it took a long time from the onset of the pain in my joints to getting it diagnosed as RA, so the early months with Ollie were difficult. He was obviously only small at that point but everyday activities like lifting him, changing his nappy, putting him into the car were very painful. Once I was seen by a Rheumatologist and put on some medication, it got much better. I still struggle when I’m having a flare-up and I don’t have the strength I used to in my wrist, but you learn to adapt over time. Have you found any ways to make life easier? I think it’s useful to look at what tasks you know you’ll have to do all the time, think about what problems you might have, and work out the best way for you and your child to do them. For example, I know I need to lift in a certain way that protects my wrist but is also safe for Ollie. It works for us. What advice would you give to others, with arthritis, about to launch into parenthood? Don’t be afraid of it. Having a child is an incredible, life-changing experience and there are ways to manage your condition to get the most out of it for you and your family. Ask your partner for help when you need it and make sure you discuss any fears or other feelings you have about the whole process. Like with anything in life, expressing those emotions to someone else can be a very positive way to deal with them.